What is your preferred workflow when making ground polygons? Model them in GMax, export as MDL object, post-process in a tool to a ground polygon BGL. Draw them in a specialized tool for ground polygons, that will export directly to a usable BGL file. Benn doing some testing today, it seems you have to raise the poly so high so it doesn't flicker when far away that your wheels sink into the poly. Is there a way to harden the poly, so you say on top of it? Would a platform work? We are going a little off topic , but I think adding platforms to all your taxiways will completely kill your performance. Also I think the MDL format can not contain so many platforms. Maybe one big one under your scenery would work, but I am not sure. How much did you have to increase the altitude to prevent flickering? Maybe one big one under your scenery would work, but I am not sure. Yes was also thinking this, but wouldn't you have to curve that to stick to the curvature of the earth any way? Will have to check at home, am at school ATM. True, so that will make this approach less useful. Since I think you will hit the platform limit quite quickly and I think it will also affect performance more than. I think creating ground polygon within Gmax is not very difficult but it takes some time. In my opinion, the only thing disturbing is the background image that we have to calibrate accurately. For example, if Gmax can show us a GoogleEarth background (like SbuilderX or FSXPlanner), it'll become more easier to model the ground polygons. Yes, I completely agree. The biggest challenge I face when creating any ground poly is getting my source image calibrated and placed accurately. I'm in favor of a tool that's completely separate from Gmax that would allow us to load either Google Earth type images or GeoTIFF backgrounds for an accurate reference on which to draw the polys. Since I only use the Gmax FS2002 game pack for gpoly creation, having a specialized tool would eliminate the need to ever boot into the older Gmax. If you are following my blog a little bit you might have seen that the first part I started working on is these background images. I can now read and display GeoTIFF files as a background image to draw on. An option to make images georeferenced if they are not is also on my wishlist and I hope to start working on that soon. 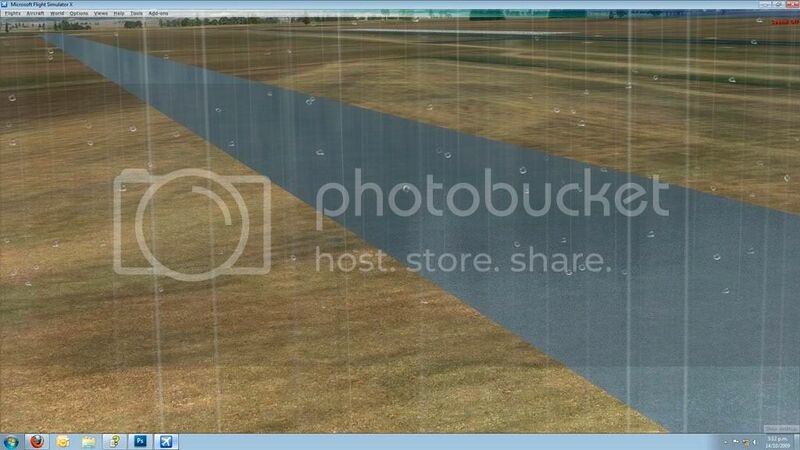 Of course the user needs to have some good reference points, like runway thresholds. I voted other like hcornea. I make FSX GPs. I use calibrated 1014 or 2032 pixel squares to mark my polys out, then cut up the image and ad the border out to 1024 or 2048 (can be done in PS but I use Globalmapper). I then use fixed sizes of GMAX polygons that correspond to the real world size of my PS layer squares and build up the full GP out of fixed sized polys or 1/2, 1/4, or 1/8th divisons of the full tile size if I am going to put multiple polys on one texture sheet. Then raise that Poly off the ground 0.03m, clone another 2 of the full scene and place them 1m and 3m off the ground as LODs, and curve the lower layer to match the earths curvature using the softselect in GMAX. Something that you could cut up a PSD/PSB/Tiff/BigTIFF/Geotiff based on markings in a layer in PS or a KML and then build up a poly/mesh based on that and apply the cut-up tiles and create materials with the appropriate settings. Then make the LOD closest to the ground match the earth's curvature, auto add the borders to the tile diffuse and tile alpha source, set the material settings, and generate a GMAX scene for further tweaking of the LODs. That is what I'd be looking for the way I do them. Some way to handle the line creaton would be ince too, but that would be a bit harder to implement. I totally agree with Toprob's comments. If you're planning a new tool, any chance of it working in fs9 too? ps; you certainly seem to be a busy fella! I have started coding this new tool already, but progress is a bit slow since the COLLADA function for ModelConverterX distracted me a bit . But I am full of ideas for gPoly at the moment, so I hope to return to it soon. Since the output of ground polygons is almost the same for FS2004 and FSX (both FS2002 gamepack techniques), this tool should work for both FS2004 and FSX. Bravo, keep up the good work! Look forward to trying it out. It is a little bit old story, but Arno I see on your blog you are still working on it. As I've polled, I would prefer gmax. But what for me would be the most important that it works for FS2004 and FSX as well.That would make our life much easier! Thanks for the feedback. Yes, progress has been a bit slow recently, but it is always encouraging to hear ideas that are close to the things I have in mind . I'd like a tool that ingests Shapefiles from ArcGIS, GRASS and QGIS, as I use them to digitise over orthophotos. If the extent of the polygons is small I find I don't need to reproject the orthophotos or Shapefiles (assuming they are in UTM or a National Grid in the first place of course). More than happy to discuss GIS + FS anytime...! Importing shapefiles is on my wishlist already, but it won't be in the first release I think. But it is for sure useful if you have access to some vector data of an airport. Is it possible to get a "NoAutogenSuppresion" function in this new tool?...that's a hard thing when doing ground polys and tweaking them. I am experimenting with exporting as FSX MDL files now. In that case I use the NoAutogenSuppression flag in the XML file when placing the polygons. Until now it seems to work quite good. Wonderful!...hope to hear more great news soon. When can we test some beta? I am about half way done with the features I have planned for version 0.1. Once these are in I will make a beta version available. At the moment I think the tool is not functional enough yet to be useful for making some actual scenery.